The following ten plants have proven over time to handle the tough conditions of low maintenance mass plantings in South Australia. There is a wide variety of shrubs, ground covers and strappy leaf plants in this selection that are drought tolerant, cold hardy and look great planted en masse. The following ten plants have proven over time to handle the tough conditions of low maintenance mass plantings. There is a wide variety of shrubs, ground covers and strappy leaf plants in this selection that are drought tolerant, cold hardy and look great planted en masse. When compared to the more robust longifolia, fluviatilis, or hystrix types, Lomandra confertifolia is a smaller, slow growing, weaker Lomandra. Although Lomandra confertifolia types have been used on many sites they are slow to establish and they’ll often die due to lack of water during establishment, or are out competed by weeds. If you are to use Lomandra confertifolia types, the smallest size pot to use is 140mm but due to the slowness of establishment you’d be better off using a minimum size pot of 175mm. Another problem with using Lomandra confertifolia types in landscapes is that in frosts, they discolour much worse than longifolia or fluviatilis types. Also, due to their less vigorous root system they also struggle in the dry. In nature they’re generally found in slightly shaded areas. The best place to use Lomandra confertilfolia types is in gardens, where they can be maintained, and weeds can be removed. Used in mass plantings, they will be almost always overtaken by weeds. Wingarra® Lomandra is the toughest of all confertifolia types, being unique in the fact it spreads from rhyzomes, and given maintenance for the first 18 months, it will spread and outcompete weeds. But it still needs a longer maintenance schedule than say Lomandra longifolia types like Tanika® Lomandra , Nyalla® Lomandra or hystrix types like Katie Belles™ Lomandra , or the new fluviatilis type called Shara™ Lomandra. The minimum size recommended for Wingarra® Lomandra is a 140mm pot. Some of the new more blue types look pretty, but they die quite easily when the times get tough. Good garden plants for sure, but avoid them for mass planting. Part of the reason why they do not perform as well as the more vigorous Lomandra species in sunny mass planted areas, can be gleamed from the botanic text books. All the Lomandra confertifolia species described grow in dry sclerophyll forest with some shade, except for one type which grows in rocky sandstone type soils. This is probably the reason why most fail in humid type climates, as well as dry climates where it is full sun and heavy soil types. We recommend the following as top performing plants for mass planting situations. They are in no particular order and each are good for different situations. Little Jess™ Dianella one of the most popular Dianella‘s for mass planting. Compact and tough with minimal care. Grey Box™ Westringia very compact native Westringia for a variety of uses. It’s unrpuned size is approx. 45x45cm. 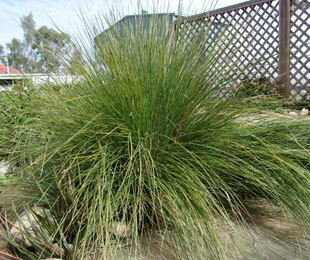 Katrinus Deluxe Lomandra is a great plant for erosion control. Lucia™ Dianella is the best spreading Dianella for roadsides/median strips—very good recovery. Mundi™ Westringia is a tough, versatile and low growing ground cover plant with less pruning required. Cassa Blue® Dianella is a compact, clumping Dianella with rich blue foliage. Not recommended for mass planting north of Syd and QLD. Green John™ Callistemon is a denser, faster establishing Callistemon than Little John. Just Right® Liriope is the best landscape Liriope. Evergreen with a uniform height. Better John™ Callistemon similar to Green John™ Callistemon, but with a blue-green colour. Katie Belles™ Lomandra has masses of perfumed flowers; great for rain gardens. Shara™ Lomandra is an alternative to Tanika® Lomandra for humid landscapes and an Evergreen alternative to Poa. 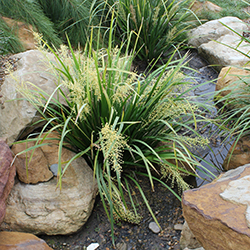 Tanika® Lomandra is one of the toughest, most reliable landscape plants. Drought tough with soft, evergreen foliage. Yareena™ Myoporum a longer lived Myoporum with crisp, clean foliage and white flowers.